Home>Dining Table Accessories>Candle votives>Metal mesh tray with five clear glass votives. 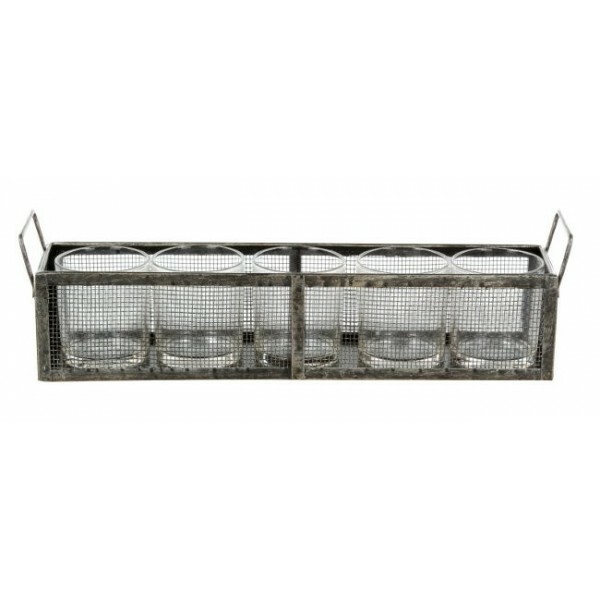 Metal mesh tray with five clear glass votives. Metal tray with five glass votives (8cm tall 7cm in diameter). Ideal for garden, conservatory or windowsill. Rustic metal tray containing five clear glass votives for tea lights, small candle (not included). Why not plant herbs in the glass containers for an instant herb garden on your kitchen or conservatory windowsill? Mix and match with our metal trays of the same design. If you use outside please remember to bring in at night - not suitable to be left outside.